Compared to Chris McVeigh's festive creations, Lego's official offering leaves something to be desired. But at the same time, it's nice to see them encouraging imagination and creativity, which is what makes Lego so awesome in the first place. 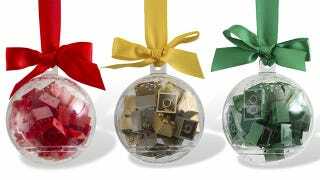 Where as Chris' creations let you hang everything from a miniature death star to a gingerbread house on your tree, Lego has simply filled a three inch clear plastic ball with a random assortment of either red, green, or gold bricks.